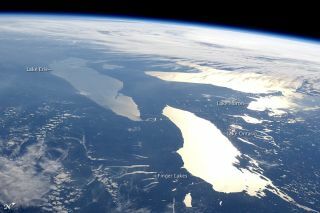 Some of the Great Lakes and the Finger Lakes from space, photographed by an Expedition 31 crew member on June 14, 2012. An astronaut aboard the International Space Station snapped this photo of several of the Great Lakes and New York's Finger Lakes. The mirror-like appearance of the water bodies is due to sunlight reflecting toward the observer. If the viewing and lighting conditions are ideal, that mirror-like surface can extend over very large areas, such as the entire surface of Lake Ontario, which is 7,300 square miles (19,000 square kilometers). The photo was taken on June 14 by an Expedition 31 crewmember using a Nikon D2Xs digital camera with a 45 mm lens. It was taken while the space station was located over Nova Scotia, approximately 740 miles (1,200 kilometers) ground distance from the center of the image. Much of central Canada is obscured by extensive cloud cover in the photo, whereas a smaller cluster of clouds in the lower left obscures the Appalachian range and Pennsylvania . The blue envelope of the Earth's atmosphere is visible above the horizon line that extends across the upper third of the image. Such panoramic views of the planet are readily taken with handheld digital cameras through ISS viewing ports, according to a release from the NASA Earth Observatory. This article was provided by OurAmazingPlanet, a sister site of SPACE.com. Follow OurAmazingPlanet for the latest in Earth science and exploration news on Twitter @OAPlanet. We're also on Facebook and Google+.